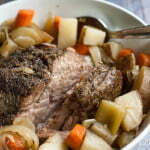 This slow cooker pork roast to ragu recipe gives you two very simple but delicious meals from one pot roast. Make your roast one night and pasta with pork ragu the next. The night before: Take your slices of garlic and stuff them into the pork roast by cutting a little slit and place the garlic inside. Next mix your salt, basil, rosemary, oregano and thyme together in a small bowl and rub all over the pot roast. The next morning: Place all of your chopped vegetables into the slow cooker and add your roast on top. The next day: For the pork ragu, take your left over pork and cut into pieces. Add to a pan along with a good marinara sauce (I like Trader Joe's Tuscano canned sauce). While the sauce is cooking, make your pasta. Both should be done around the same time.